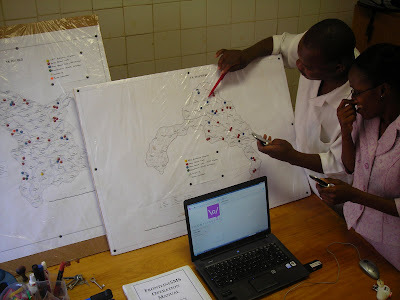 In 2008, FrontlineSMS was implemented as a central SMS hub for a rural hospital in Namitete, Malawi. Located 60 km from Lilongwe, St. Gabriel’s Hospital serves 250,000 Malawians spread over a catchment area 100 miles in radius. The vast majority of the people the hospital serves are subsistence farmers, living on under $1 a day. • The catchment area has an HIV prevalence rate of 15% combined with widespread malnutrition, diarrhea, Multi-Drug-Resistant Tuberculosis (MDR TB), Pneumocystis pneumonia (PCP) and other opportunistic infections. Three medical officers are employed at St. Gabriel’s – creating a physician-to-patient ratio of 1:80,000. • The hospital has enrolled over 600 volunteers to act as community health workers (CHWs) in their respective villages. Many of the volunteers are active members of the HIV-positive community, and were recruited through the hospital’s antiretroviral therapy (ART) program. Distance presents an often-insurmountable obstacle for patients seeking care at St. Gabriel’s. Many patients walk up to 100 miles to the hospital; those with more resources ride bicycles or oxcarts. In order to report patient adherence, ask for medical advice, or request medical care for remote clients, CHWs had to travel similar distances to the hospital’s doors. The most motivated of the CHWs kept their own patient records, and journeyed to the hospital every few months. Their activities effectively isolated by distance, the impact of the volunteers’ work was restricted to their communities and disconnected from the centralized medical resources at the hospital – their potential role delivering healthcare stifled by disjunction. During the summer of 2008, I traveled to St. Gabriel’s with 100 recycled cell phones and a copy of FrontlineSMS – a free program developed by Ken Banks to act as a central text-message hub. My plan was to implement a text-based communications network for the hospital and the CHWs. In groups of 10-15, CHWs were brought to the hospital, given cell phones, and trained in text messaging. The volunteers’ locations were mapped, and the phones were disseminated throughout the catchment area. Stationed at the hospital, a laptop running FrontlineSMS coordinates the health network’s activities. The day-to-day program operations were handed over to hospital staff within two weeks. FrontlineSMS is operated by Alexander Ngalande, a nurse who heads the hospital’s Home-Based Care program. CHWs in the field have been given basic drug supplies (e.g. Panadol, Ferrous Sulfate, eye ointments) for primary care. The CHWs now check drug dosages and uses within seconds. When FrontlineSMS receives an SMS with a drug name, it automatically responds to the health worker with that drug’s information. CHWs regularly update the hospital staff with regards to patient status, including reporting patient deaths. These messages have created a post-discharge connection to patients’ well being. In addition to responding to medical emergencies in the communities, the Home-Based Care (HBC) unit also follows a schedule of home visits – sometimes checking on patients have been discharged recently. Other patients are enrolled in the hospital’s palliative care program. Before traveling to the patients’ villages, the mobile unit text messages CHWs in close proximity to the clients they plan to visit. Any response by the CHW (e.g. “Patient is not at home.”) is forwarded to the mobile team’s phone, allowing medical staff to maximize their productivity by visiting available patients. HIV Counseling and Testing (HCT) at the hospital has been augmented because of the SMS network. If a client tests positive, he or she is paired with to an HIV-positive CHW with a phone – these volunteers act as models for Positive Living and provide comfortable, relatable links to the hospital. 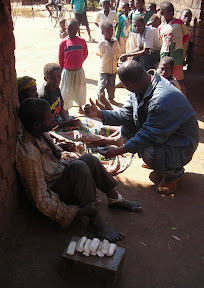 The connection to hospital services has solidified the CHWs’ role as legitimate healthcare representatives in their villages. The patients and their communities, according to the program’s participants, have noticed the phones, each one clearly marked with the hospital’s logo. The phones provided very concrete incentives for the volunteer work done by the CHWs. The SMS network created, for the first time, a way to track the CHWs’ activities, paving the way for more informed decisions regarding allocation of resources (e.g. which CHWs should receive bicycle ambulances). A whole-hearted thanks goes out to everyone who has been reading these posts. I’d be thrilled to hear from you. In the next few days, I’ll put up a post that will (attempt to) cover the various, exciting ways this project is moving forward. In the next week or so, I’ll also be developing a DIY guide, based on a series of FAQs – much more on this later. The most interesting and the most intriguing, well here Халявная аська. Tesekkürler cok basarili bir site olmus. Basarilar dilerim.